Yes! Please contact me to arrange for a complimentary Retirement Second Opinion meeting. Upon the conclusion of the meeting, you will receive a copy of Paul Byron Hill's new book, Retire Abundantly. 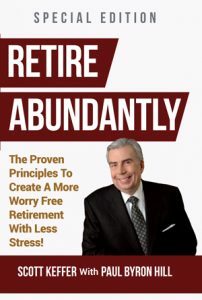 Professionals, executives, and business owners will gain insight, principles and practical advice on how to enjoy a great retirement and leave a lasting legacy in Retire Abundantly, a new book co-authored by Paul Byron Hill.